Chimpanzees, along with bonobos, are our closest living relatives. Chimpanzees are highly intelligent, living in complex social groups. Chimpanzee populations have declined due to contagious diseases such as ebola and anthrax. Due to other threats such as hunting, habitat loss and degredation, wild chimpanzees face the risk of extinction. Chimpanzees are hunted for their bushmeat. When females are killed, their young are often taken and sold as pets. 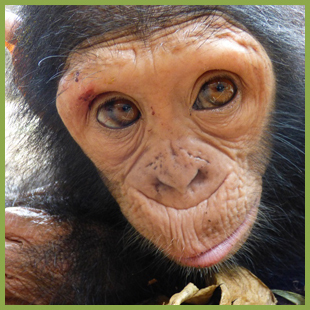 Funds from your adoption will help care for rescued orphaned chimps, monitor chimps in their natural habitat and support law enforcement efforts across Africa. 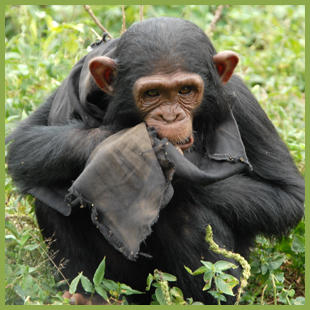 You can make a difference to a wild animal by adopting one of our chimpanzees below. Chinoise was just a few weeks old when her mother was killed by poachers and she was sold as a pet to a Chinese restaurant in Cameroon. Sara was sickly and terrified when she was confiscated from a wildlife trader in South Sudan who tried to sell her as a pet.